This paper describes a system for autonomous spray painting using a UAV, suitable for industrial applications. This paper describes a system for autonomous spray painting using a UAV, suitable for industrial applications. The work is motivated by the potential for such a system to achieve accurate and fast painting results. The PaintCopter is a quadrotor that has been custom fitted with an arm plus a spray gun on a pan-tilt mechanism. To enable long deployment times for industrial painting tasks, power and paint are delivered by lines from an external unit. The ability to paint planar surfaces such as walls in single color is a basic requirement for a spray painting system. But this work addresses more sophisticated operation that subsumes the basic task, including painting on 3D structure, and painting of a desired texture appearance. System operation consists of (a) an offline component to capture a 3D model of the target surface, (b) an offline component to design the painted surface appearance, and generate the associated robotic painting commands, (c) a live system that carries out the spray painting. 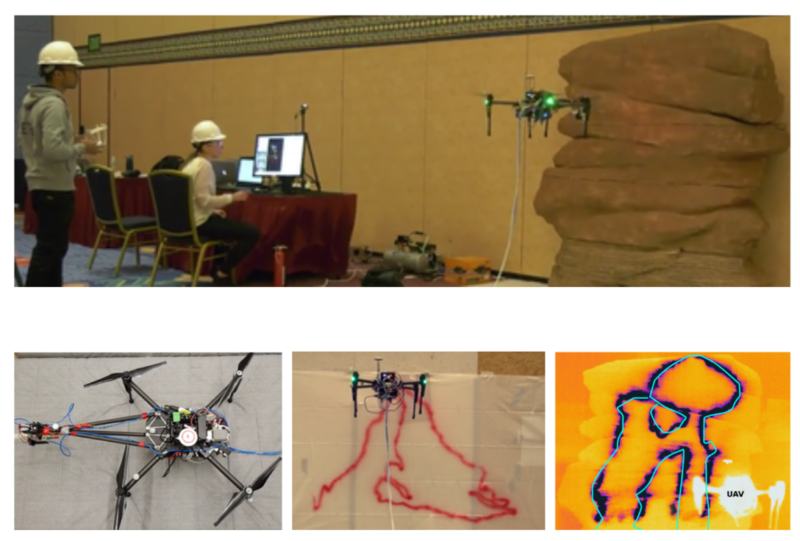 Experimental results demonstrate autonomous spray painting by the UAV, doing area fill and versatile line painting on a 3D surface.